Budapest is easily accessible by air from much of Europe and even the US. 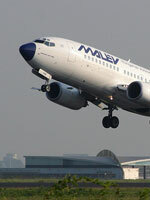 The nation's main carrier, Malev, flies to almost every major city on the continent including London, Dublin, Paris, Berlin, Prague and Moscow, as well as to New York, Washington, Beijing and Sydney, whilst budget airline Wizzair is based in Budapest and offers many more seats across Europe. As always, book early to get the best prices on flights to Budapest. An airport minibus serves all three terminals, whilst the BKV Plusz Repter Busz will take you to the Kobanya-Kispest metro stop at the south east end of the blue line, from where you can zip into town. A taxi will cost 5000-6000 forints. 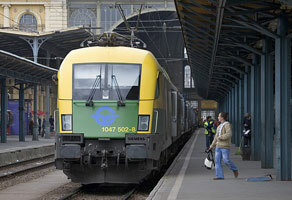 Budapest has three international train stations, Keleti, Nyugati and Deli. Keleti however handles most international passengers, many of whom arrive from Krakow, Vienna and Bratislava on their European backpacking tour. Meanwhile,Zagreb and Belgrade are increasingly popular destinations accessible from Budapest for those looking to delve further south. Overnight trains tend to be comfortable enough for those who buy a sleeper ticket, although don't plan on getting too much sleep as two sets of guards will wake you up every time you cross a border. Present them your passport and smile nicely. 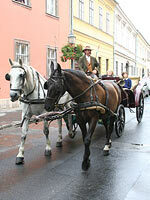 You can get to and from Keleti into the centre of town on the red metro line, or take a fifteen to twenty minute walk. A multitude of coach services are available from Budapest's international bus station, Nepliget, courtesy of Volanbusz (the Hungarian associate of Eurolines). 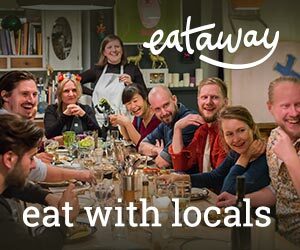 For example daily services go to Vienna (from where you can connect by bus to London), whilst four buses a week go to Amsterdam, two a week to Rome and Split and it's even possible to get out to the likes of Kiev (once a week). Nepliget has it's own metro station on the blue line, making it easy to get to. Budapest is not the best connected city by road if you're travelling from outside Hungary, nor is it the best country for driving in thanks to substandard roads, poor local driving skills, and over-zealous traffic police. If you are braving it, chances are you'll be arriving from Vienna. From here head to Hegyeshalom and take the M1 (toll road) and then the E60/75 will take you to Budapest.